The Magic Millions Gold Coast National Broodmare Sale takes place in the week leading up to the Derby at Epsom, arguably the most important race in the Flat calendar in Europe. Breeders and other bloodstock agents might be absorbed by the Classic action but the auction on the other side of the world could also have long-term repercussions in the industry. After all, one of the highest-achieving families anywhere in the world in the new millennium is so Australian that its members – including last year’s close Derby third Idaho – must have green and gold blood coursing through their veins. Idaho is out of the Danehill mare Hveger, crowned the Racing Post Bloodstock broodmare of the year for 2016 after her son finished placed in Derbys at both Epsom and the Curragh and won the Great Voltigeur Stakes. 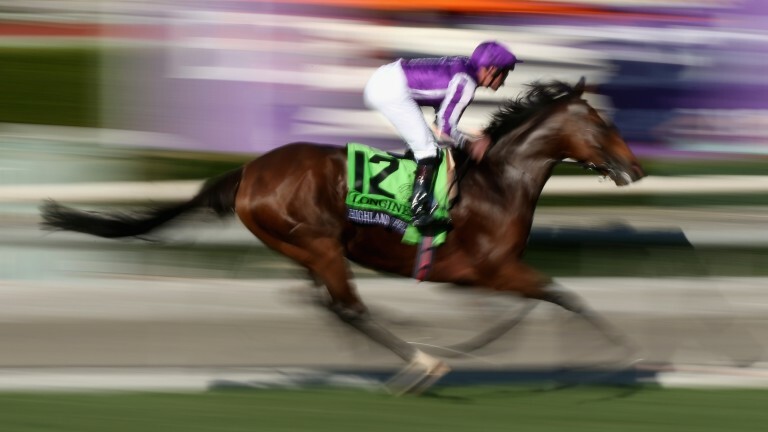 Another son, Idaho’s brother Highland Reel, landed the King George VI and Queen Elizabeth Stakes and Breeders’ Cup Turf. Hveger, third in the Australian Oaks in her own racing career, was imported to Ireland from Australia by Coolmore after she produced Valdemoro, runner-up in the Crown Victoria Oaks and Storm Queen Stakes, as her first foal. She has been mated with the operation’s phenomenal sire Galileo every year since. Hveger is a sibling to two other Aussies who shone on the international stage – Elvstroem, whose five top-level victories included the Dubai Duty Free, and Haradasun, a dual Group 1 winner who stormed Royal Ascot to take the Queen Anne Stakes. The dam of Hveger and co was the late matriarch Circles Of Gold – incidentally, a half-sister to the granddam of another Australian world-beater in Starspangledbanner – who had won the AJC Oaks in her own racing career. The genesis of that run of success for the family was the purchase of Circles Of Gold for her reserve price of A$50,000 at the yearling sales in Australia in 1993. Hveger is not the only high-class Australian mare John Magnier’s operation has put its faith in on the hunt for well-bred sorts with some speed about them to mate with Galileo – a well-trodden path to breeding a Group 1 winner. >>Atlantic Jewel, one of several Australian daughters of Fastnet Rock who have been exported. The A$320,000 Magic Millions yearling landed three Group 1 contests – the All Aged Stakes, Memsie Stakes and Caulfield Stakes – and she has a two-year-old colt and a yearling colt, both by Galileo, and was covered by the perennial champion sire again in 2016. >>Believe’N’Succeed, a daughter of Exceed And Excel who was not beaten far in the Blue Diamond Stakes, is the dam of Group 1-winning sprinter Bounding. 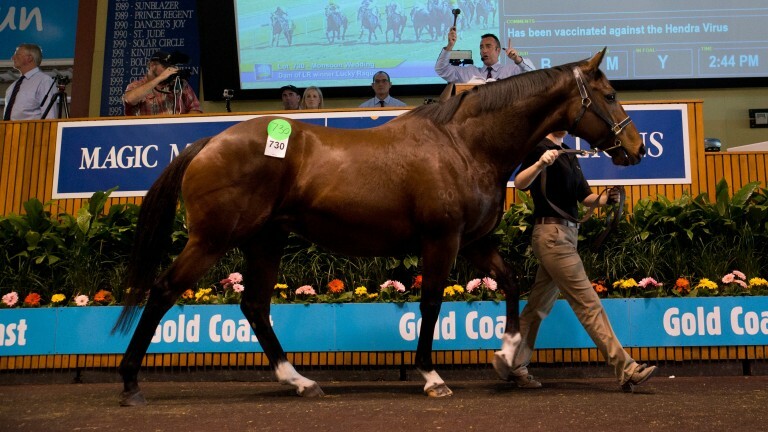 Since being purchased at the National Broodmare Sale for A$1.1 million she has produced a yearling colt by Galileo. >>Fix is Antipodean but from New Zealand rather than Australia, although it was at Magic Millions that she was sold as a broodmare for A$1.25m. By Iffraaj out of a Danehill mare, she was a triple Group 2 winner and finished placed in the New Zealand 1,000 Guineas and Derby. Covered by Galileo last year. >>Melito, a daughter of Redoute’s Choice who was a dual Group 1-winning sprinter in the TJ Smith Stakes and Winter Stakes and finished placed in a further seven top-level races. Originally a A$600,000 Magic Millions yearling, she was sold for A$1.65m at the company’s National Sale. Already the dam of Campbell Junior, a Grade 3-placed performer in Japan, she has a three-year-old colt by Galileo, a two-year-old filly by Galileo sold to Emirates Park at Tattersalls last year for 500,000gns and returned to the same sire last year. >>Monsoon Wedding, a sister to influential sire Redoute’s Choice, sold in foal to Pierro as part of the Teeley dispersal for A$2.3m. The filly being carried in-utero was sold to James Harron and De Burgh Equine on behalf of Hill ‘n’ Dale Farm master John Sikura for A$1.4m. Monsoon Wedding has a yearling colt by Galileo on the ground. >>Nechita, a A$130,000 Magic Millions yearling who won the Coolmore Stud Stakes and was subsequently sold at the National Broodmare Sale for A$1.55m. The daughter of Fastnet Rock has a yearling colt by Galileo and returned to the sire last year. >>Sea Siren, a Fastnet Rock mare who was a triple Group 1 winner in the BTC Cup, Doomben 10,000 and Manikato Stakes, and later joined Aidan O’Brien, for whom she won the Listed Belgrave Stakes and finished second in the Group 3 Fairy Bridge Stakes. She has a two-year-old Galileo filly called Betsy Ross and was covered by the sire again last year. As the sale of the Pierro filly out of Monsoon Wedding to John Sikura shows, breeders in America appear to be keen to jump on the bandwagon of Australian breeding success too. Although those with long memories should be well aware of the power of the country’s bloodlines, as it was only in the 1990s that Australian champion-turned-globetrotter Strawberry Road sired three Breeders’ Cup winners. Lonhro stood in Kentucky with a degree of success and Hampton Court and Vancouver have also attracted interest in their first seasons in the Bluegrass. Stonestreet Farm paid A$1.9m for Bounding at the Magic Millions National Broodmare Sale last year, and the daughter of Lonhro is now part of the star-studded broodmare band at Barbara Banke’s stud. At the same sale, Greg Goodman of Mt Brilliant Farm in Kentucky added Golden Cropper, a More Than Ready mare out of a Group 3-winning three-parts sister to Redoute’s Choice, and Darci’s Dream, a Group 1-placed daughter of Darci Brahma, to his cosmopolitan mare ranks for A$650,000 and A$290,000. Banke and Sikura led the charge of American investment in the Teeley dispersal at Magic Millions in 2014. "It was the southern hemisphere and pedigrees that were a bit unfamiliar," recalled Sikura of his first trip to Magic Millions. "I took a deep breath and bought two expensive maiden fillies. When they got home, everybody scratched their heads and wondered if I’d lost my mind." But after Sikura sold produce of his mare purchases for big bucks in Kentucky last year, he said: "It worked out well and I think it’s good for international commerce that the pedigrees work and we start to trade with each other." blue-chip breeding prospects and so, naturally, they have tapped into Antipodean bloodlines. Their breeding programmes already feature the privately acquired Group 1 winners King’s Rose, More Than Sacred, Mosheen and Shamrocker. All have produced progeny by Japan’s perennial champion sire Deep Impact. Driefontein is a sale into the Yoshida broodmare band of which Magic Millions can be particularly proud as the daughter of Fastnet Rock was a relative bargain A$75,000 yearling acquisition from the company and was awarded the Magic Millions 2yo Classic en route to gaining a Group 1 laurel in the Robert Sangster Stakes. Group 3 Lord Mayor’s Cup just before her date in the Magic Millions ring and justified Yoshida’s outlay of A$575,000 by finishing a head second in the Group 1 Tattersalls Tiara on her next start. >>Kneeling, a multiple Listed winner by Encosta De Lago out of the Listed-placed Sunday Silence mare Sunday Service, who cost A$800,000. >>Nocturnelle, a Listed-winning daughter of Elusive Quality and Group 3 scorer Dama De Noche, who was bought for A$600,000. vvResponse, a dual Group 1-winning daughter of Charge Forward who had produced Group 2 scorer Returntosender and in foal to Snitzel. She cost A$1.5m. The recent Grade 3 victory of the Fastnet Rock filly Melagrana for Kazumi Yoshida in Japan could have endeared the Japanese even more to Australian families. Buyers from Japan, the US and Europe will likely join the fray next month hunting for broodmare talent on the Gold Coast, where there will be the customary strong domestic bench alongside visitors from South Africa and Singapore, where Australian bloodstock has a rich history of success, plus the emerging markets of China and the Middle East. Last year Australian breeding also gained the royal seal of approval, as the top-class racemare Sweet Idea was acquired to join the Queen’s broodmare band. Sweet Idea will surely be a boon to the Royal Studs. She was trained by Gai Waterhouse to win the prestigious Group 1 Galaxy as well as four Group 2 events and to finish placed another four times at the highest level, including when third in the Golden Slipper. She is by red-hot Australian sire Snitzel out of the Group 3-placed Timber Country mare Flidais, herself out of champion mare Electronic and also the dam of stakes performers Rush and Showtime. Sweet Idea was sent to Galileo last year but failed to get in foal – she may have still been adjusting to the new climes in Europe – but made the return trip to Coolmore this year. A resultant foal would certainly be bred to run well in the Derby or other European Classics. Who knows? She could be the next Hveger.